I don’t drink tea. Or coffee. Never started it and somehow never feel the need to either. When I found myself in a tea boutique, in Srilanka, my eyes fell upon rooibos and I picked up a pack of rooibos red and green tea, more out of curiosity to try new ingredients than anything else. And when I got back home and unpacked, the rooibos cartons got stacked on the last shelf of my stock cupboard and I promptly forgot about them. Months later, when I was pregnant I realized that rooibos was caffeine-free and decided to take a sip to beat some momentary prenatal blues. And I got hooked. From then, until now it has become one of my most favourite beverages and you will find me sipping a cup of rooibos in the evenings every now and then. I like the naturally sweet taste, gorgeous deep red colour and pure flavours of rooibos and prefer not to add any sugar or milk to my daily cuppa. But, once in a way I like to indulge myself and make masala chai. 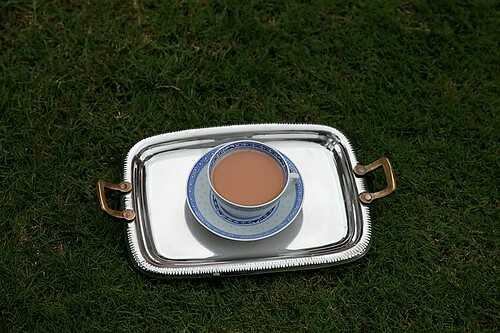 After my wonderful break at my parents, on one evening in Bangalore at my in-laws, I found myself sipping some masala chai, relishing every sip, sitting on the green lawn overlooking the house and helping myself to a second cup from my mother-in-law’s beautiful silver tea set. The setting was perfect for taking pictures for this post and out came my beloved camera to record the moment. 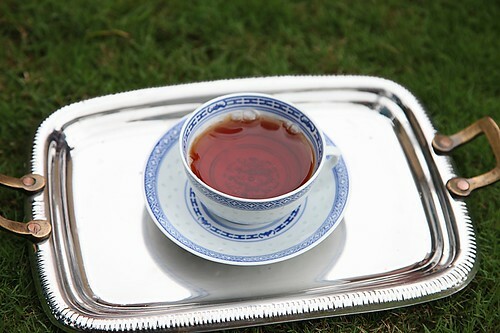 Rooibos is gaining popularity as a health drink, the world over. Low in tannins, free from oxalic acid, naturally caffeine free and rich in phytochemicals, minerals and antioxidants, this delicious tea from South Africa is known to treat several ailments like allergies, skin diseases, insomnia and many other diseases. Since, it contains no caffeine it is safe for pregnant and nursing mothers and South Africans are even known to treat infant colic with this tea. Since it is arguably similar to tea, this is very close to masala chai, the popular Indian drink. Indians are known to add ginger (adrak) and cardamom (elaichi) to their tea and masala chai which is a combination of many spices is an extremely popular Indian staple. There are many versions and variations to the spice mixture added to masala chai and one can easily find powders of several spice blends in stores here. But, I like to brew my tea using whole spices like cinnamon, cardamom, ginger, pepper and cloves, since powdered spices tend to lose their essential oils over time. This is also a surefire way to beat a cold. It is amazing how these spices are bestowed with healing and uplifting properties and a drink like this can enliven your senses and make you forget all woes. Drinking and making this is therapeutic. The aromas of the spices wafting from the bubbling pot is nothing but enchanting. All I can say is make this, sit back, relax and take a sip and see all your troubles vanish! Dont skimp on the sugar for this tea and have it as sweet as you can take it. The sugar balances and complements the heat of the spices. I like to brew rooibos for a long time since it gives out more colour and flavour this way. Unlike regular tea, rooibos can be reheated and it wont be biiter. In a saucepan, pour in the water and add all the whole spices, the cinnamon, cardamom, clove, pepper and ginger and bring to a boil. Allow to simmer for 5 minutes. Add in the rooibos and continue to simmer for another 5 minutes. Put in the sugar and the milk and switch off the flame. Strain and serve immediately. I'm a green tea addict, and what disturbs me under all its wonderful antioxidants is the caffeine, only because I drink so much of it. Rooibos cures insomnia?! – then its a sure deal for me. Although, I don't remember seeing it on the shelf besides the other teas. Where can I find it? (somewhere closer to home than Srilanka). Esha: I have seen rooibos in some speciality stores here, at exorbitant rates. I order mine from a supplier in Cochin. Unfortunately, he doesnt stock Rooibos green, which is a fav too. However he has rooibos red. Sunbeam Mercantile Ventures Pvt. Ltd. I have never really seen this stuff but I'm curious now. May be I 'll look out for it. Also inspired me to write a post to Indian Tea on my blog. I'm not a tea addict like most of us Indians but I surely enjoy my cuppa tea specially Masala tea. P.S. Can I have your MIL? 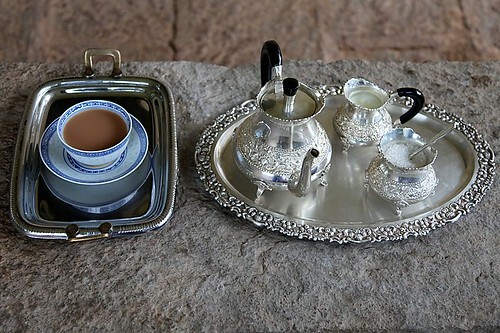 I want that tea set :). Its gorgeous! I got hooked to the rooibos when I read McCall Smith's Ladies No.1 Detective Agency set in Botswana – there they sip red bush tea all day – got this Red Rooibos from London-love the smoky taste of it. 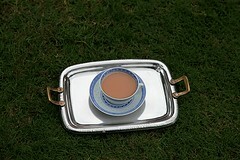 The tea set is to die for! Kulsum: You will enjoy the flavours when you find it. You could have had my mil, if she was not already taken by me. 😉 I called her to ask her about the tea set and she says it is already named for her grandson "Harivansh". Not even me! Nandita: You find this tea smoky? I love it for its mellow flavours. So divine! 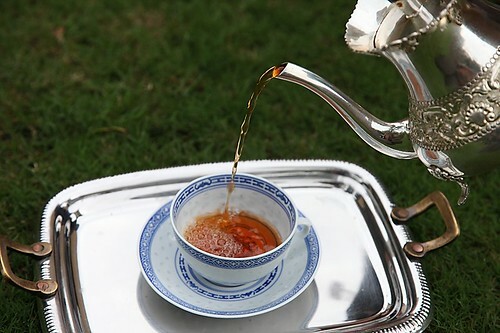 Tea looks so soothing! Beautiful. I love the tea set! Oh ur pics are so beautiful and u truly make masala chai excitn! Lovely post Anu. Rooibos is the only herbal tea I drink to be honest. Even just plain it doesnt seem to need any sweetening as it has such a lovely mild & natural taste. Should really try it with spices. 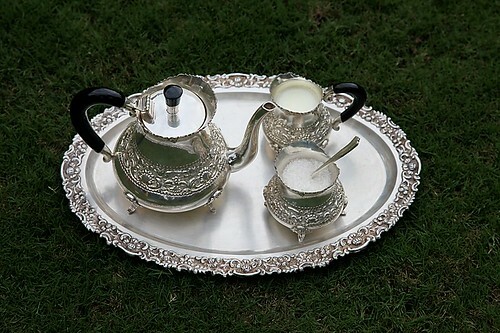 The tea set is simply amazing. I have never tasted rooibos until now. But after reading about it now, I will definitely give it a try. Thank you everybody. The tea is as good as the tea set, I promise! Neena: Thank you and wish you and your family a happy diwali too. Maunika: Do give this a try with the spices. It is one of the most refreshing and soothing drinks I have ever had. Mona: You will love the colour and flavour of rooibos. Rooibos Tea is great for pregnant women because of there being no caffeine in it. It also has many other benefits. Dilekha- My trip to Srilanka was amazing and momentous. We travelled with some locals who took us to this place, don't recall where it was, considering my trip was 9 years ago.